Attorney Craig Tractenberg, a prominent franchise litigator with Philadelphia-based Fox Rothschild LLP, has threatened to smear UnhappyFranchisee.Com publisher Sean Kelly’s reputation and hit him with a lawsuit if he doesn’t delete unflattering comments posted about his client, Sterling Partners’ School of Rock and School of Rock CEO Dzana Homan. (UnhappyFranchisee.Com) With their Franchise Advisory Council disbanded, their franchisee association unrecognized by management, and a CEO who allegedly punishes anyone who expresses a grievance, School of Rock franchise owners came to UnhappyFranchisee.Com to express their dismay at the decline of their once-vibrant company and company culture since CEO Dzana Homan took the helm. One of the most widespread and consistent allegations is that Dzana Homan is a feared dictatorial CEO who suppresses idea-sharing and dissent through bullying, threats and vindictiveness. Franchisees were less consistent in their opinions as to whether private equity parent Sterling Partners was aware of Ms. Homan’s allegedly brutal leadership style, and whether they condoned or even directed her actions. Sterling Partners seemed to erase all doubt when it (apparently) authorized it’s big-time, expensive “Super Lawyer” attorney Craig Tractenberg to call web publisher Sean Kelly and intimidate him into erasing complaints posted by School of Rock franchise owners and employees. According to Tractenberg, School of Rock and Sterling Partners have already incurred costs of near $30,000 to dig up dirt and threaten Kelly. Please help us spread the word about the unacceptable practices of Craig Tractenberg, School of Rock’s Dzana Homan, and Sterling Partners practices by sharing this post and by circulating this press release (pdf copy below). 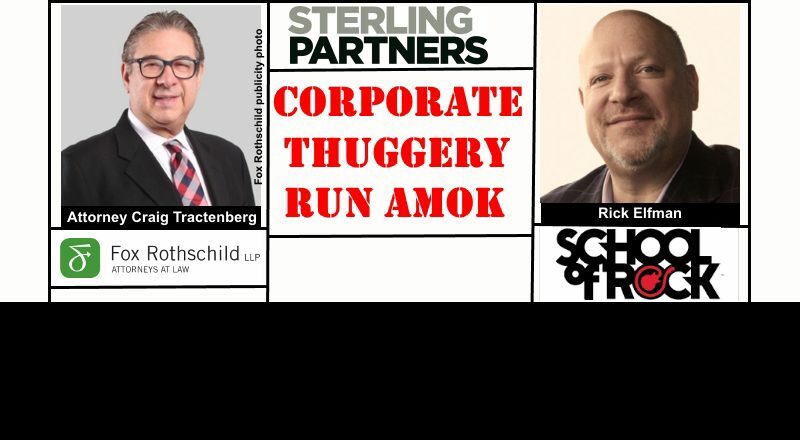 Please also leave a comment below letting Mr. Tractenberg, School of Rock executives and Sterling Partners how you feel about corporate bullying and intimidation. Fox Rothschild partner Craig Tractenberg is threatening to release damaging information about UnhappyFranchisee.Com publisher Sean Kelly if Kelly refuses to delete complaints posted by School of Rock franchise owners from his controversial website. June 8, 2017 (Lancaster, PA) – One of the most successful and powerful attorneys in the franchise industry is threatening to distribute damaging financial, bankruptcy, litigation and divorce records about UnhappyFranchisee.Com publisher Sean Kelly if he refuses to delete franchise complaints shared by School of Rock franchisees. Craig Tractenberg, who is a partner in the Philadelphia-based law firm Fox Rothschild LLP, represents the School of Rock franchised music education chain which has been owned by private equity firm Sterling Partners since 2009. Tractenberg also threatened to attack Kelly with a lawsuit in order to force him to remove unflattering comments and allegations regarding the culture of bullying and the allegedly dictatorial, vindictive management of CEO Dzana Homan. Some School of Rock (SoR) franchisees allege that Sterling Partners is intentionally trying to force successful franchisees out of the system so they can take over their businesses for pennies on the dollar. The threats occurred during an 11-minute, unscheduled call shortly before noon on Tuesday, June 6, 2017. Kelly reports that for about a week he had repeatedly reached out to CEO Dzana Homan and other executives at School of Rock and Sterling Partners to invite comments, corrections or rebuttals to the allegations posted to UnhappyFranchisee.Com. Kelly estimates that more than two dozen School of Rock franchisees have complained anonymously for fear of retaliation. After Kelly answered the unscheduled call, he says Tractenberg introduced himself as counsel for School of Rock and told him that he had done extensive research on Kelly that included financial records, bankruptcy records, information on a prior lawsuit and his divorce records. Tractenberg stated that if Kelly failed to remove all content related to his client from the UnhappyFranchisee.Com website, the damaging personal information on Kelly would be released. Tractenberg, who, according to his bio, has been named “Best Lawyer,” “Super Lawyer, ”Lawyer of the Year” and Franchise Times “Legal Eagles Hall of Fame” inductee, also threatened Kelly with a lawsuit. Tractenberg bragged that his firm had already racked up nearly $30,000 worth of research and preparation for School of Rock’s actions against the web publisher. When Kelly asked Tractenberg whether it was unethical, if not illegal, for an attorney to threatening to harm someone’s reputation if that person didn’t meet his demands, Tractenberg said it was not. About UnhappyFranchisee.Com: UnhappyFranchisee.Com is a franchise issues and discussion website that educates and informs prospective franchise owners and enables current and past franchise owners, franchisors and their employees to discuss and debate franchise topics. All individuals and companies discussed on the site are invited to provide corrections, clarifications, and/or rebuttals for publication. About Sean Kelly: Based in Lancaster, PA, Sean Kelly is a 25+ years veteran of the franchise industry, having been VP of an international franchise consulting firm, Director of Marketing of an international franchisor, founder of an award-winnning franchise marketing firm, industry writer, speaker and expert witness in franchise litigation. He has been interviewed on franchise matters by the Wall Street Journal, Forbes, NPR, Bloomberg, Washington Post, Dateline NBC and was featured on the Australian Broadcasting Company’s Four Corners expose on 7-Eleven. Mr. Kelly has never been divorced. ARE YOU FAMILIAR WITH ATTORNEY CRAIG TRACTENBERG, FOX ROTHSCHILD LLP, SCHOOL OF ROCK CEO DZANA HOMAN, THE SCHOOL OF ROCK FRANCHISE OPPORTUNITY, AND/OR STERLING PARTNERS ? SHARE A COMMENT BELOW. Disappointed beyond belief with the tactics of this attorney and the firm he represents. It definitely shows a corporate culture of bullying behavior and lack of respect for the truth. The conduct and actions of this attorney are disgraceful and dishonorable. It is extremely disappointing that Sterling and the School of Rock board would support this type of behavior. However, given the corporate culture that has existed during Ms. Homan’s tenure this is not surprising. There have been no responses to valid questions although many opportunities to speak to the issues have been given. Their silence speaks volumes.